1 of 1 Heat oven to 375 degrees F. Coat 15 x 10-inch jelly-roll pan with nonstick vegetable-oil cooking spray. Line bottom of pan with waxed paper; lightly coat waxed paper with cooking spray. 1 of 5 Beat egg whites and cream of tartar in large bowl until foamy. Gradually add 1/4 cup granulated sugar and beat until soft peaks form. 2 of 5 Beat together oil and remaining granulated sugar in second large bowl until well mixed, about 1 minute. Beat in vanilla. 3 of 5 Stir cake flour into oil mixture. Gently fold in a quarter of the egg whites until completely blended, then gently fold in remaining egg whites. Spread the batter evenly with a spatula in the prepared pan. 4 of 5 Bake in 375 degrees F oven for about 12 minutes or until top is very lightly browned and springs back when lightly touched. 5 of 5 Run knife around edge of cake to loosen. Sprinkle top with 3 tablespoons confectioners sugar. Cover with clean kitchen towel. Top with slightly larger baking sheet; invert. Remove pan, then waxed paper. Starting at shorter end, roll up cake in towel. Cool completely, seam side down, on wire rack. 1 of 1 Stir together cream cheese, sour cream and strawberry jam in medium-size bowl. Gently fold in strawberries. 1 of 1 Unroll cake. Spread cream cheese mixture over cake, leaving 1/2-inch border all around edges of cake. Carefully re-roll cake. Refrigerate for at least 1 hour. 1 of 1 Place cake, seam side down, on serving platter. Trim ends of cake. 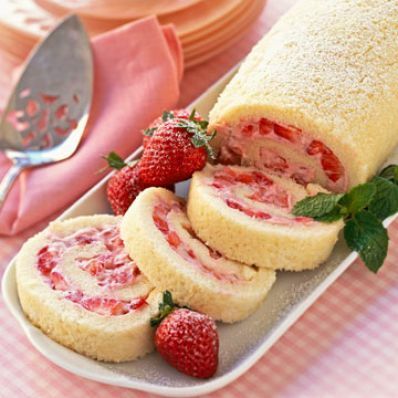 To garnish, sprinkle roll evenly with confectioners sugar. Fan thin strawberry slices down center of cake, if desired. Per Serving: 265 kcal cal., 214 mg sodium, 0 g fiber, 20 mg chol., 5 g sat. fat, 13 g Fat, total, 5 g pro., 32 g carb.